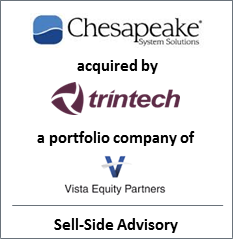 Evergreen Advisors Capital, a middle-market investment bank, is pleased to announce that Chesapeake System Solutions, Inc. (“Chesapeake”) has been acquired by Trintech, Inc. (“Trintech”) a portfolio company of Vista Equity Partners and Spectrum Equity. Evergreen Advisors Capital acted as the exclusive financial advisor to Chesapeake. Chesapeake delivers innovative financial software to the world’s leading retail, banking, corporate, insurance and financial institutions. Trintech is a leading provider of cloud-based financial solutions for the integrated Record-to-Report process. Trintech has over 900 clients worldwide with offices in the USA, UK, Australia, Netherlands, France, and Ireland, and partners in South Africa, Latin America, and Asia.